The easterly winds finally stopped and as a result, the fishing on the beach today was excellent. 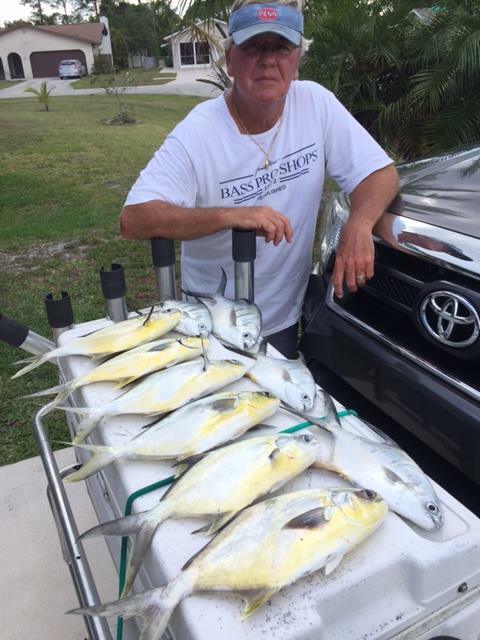 I fished at Hobe Sound this morning and caught a nice limit of pompano along with some big palometa. All of the fish were caught on clam strips and sand flea scented Fishbites. Chuck Frith from Jensen Beach and Marty Barlow of Robbinsville, NJ fished just north of me and also put together a nice catch of pompano. The fishermen that were targeting bluefish right near the beach entrance on Bridge Road had a great bite going on when we were leaving at 11 am. This is great springtime surf fishing so plan a trip if you want to get in on this great action. I received a call from a friend who fished at Middle Cove this morning and the report from there was good as pompano and whiting were bending rods at that location. The west winds are forecast through Wednesday night so conditions should remain excellent. Clam strips, Fishbites, and sand fleas should produce action on the pompano, cut mullet or jacks for the bluefish, and Fishbites and cut shrimp should produce for folks who are targeting the whiting and croaker.